A couple years ago, BioWare did a BioWare Base panel on LGBTQ representation in our games at PAX. We heard concerns, praise, and a lot of heartfelt discussion about how we present characters from the LGBTQ community. One of the most repeated requests was for representation of transgender and/or genderqueer characters in a way that did not make them either a monster or a joke. When the panel was over, some of us kicked around ideas about what we could do. Talking over drinks at the bar later, we hit two major challenges. First, any conversation about the subject had to come up naturally in-game. A minor character like a shopkeeper would have no reason to explain that she is trans, so either the conversation would never come up or it would come up because her voice was clearly masculine, at which point it would look like a joke to most players, no matter how we tried to write it. Second, the character had to serve a purpose beyond “being there to be a genderqueer person.” Every character in our game serves a purpose—reinforcing the theme of a plot, character, or area—and we do not have the budget for someone who is just there to tick off a box. As we discussed ideas, the possibility came up of Iron Bull’s lieutenant being such a character. Bull needed a lieutenant. He’s a mercenary commander, and even if we didn’t have the memory budget to have his entire company around all the time, I needed to be able to remind players that Bull has a history of command. In addition, Bull’s loyalty is pulled between life under the Qun and a life of freedom, and I needed a character on each side who could represent that pull. Cremisius “Krem” Aclassi met both challenges. His conversation could come up naturally, along with discussions of life as a mercenary, and he could serve a vital role in the story as a grounding force who would remind the player that Bull is more than just hired muscle. Krem’s status as a trans man, rather than being just tacked on, could emphasize Bull’s character by opening up discussions of Qunari gender roles. Once we had decided what we wanted to do, we tackled the concept of Krem with other departments to figure out how to do it correctly. In doing so, we saw how much of our game’s engine was based on set gender assignments, from voice to face to animation set to localization plan for foreign languages. Every single department stepped up enthusiastically to make sure that Krem was created with respect. Colleen Perman gave Krem his fantastic face using the character art team’s head-morph system, John Epler nailed his animation and body language, Caroline Livingstone and Jennifer Hale found a great voice for a trans man in a world without access to transitional procedures, and Melanie Fleming made absolutely certain that Krem was gendered appropriately in all languages. On the writing side, I wrote Krem as best I could, and the editing team looked at every line and cleaned up dialogue and paraphrases that could give the wrong impression. I then passed him to two friends in the GQ community… at which point they showed me where I was absolutely messing things up and gave me constructive feedback on how to improve. In the first draft, Bull was the one who brought up Krem’s binding as a friendly joke. My friends pointed out how incredibly hurtful such a callout was for many trans people in real life (“Hey, by the way, you’re actually a woman, just wanted to remind you!”) and that it made Bull into an incredibly offensive jerk. This was not at all what I wanted—people playing now will note that Bull and Krem give each other grief about little things all the time, but never attack truly sore spots—and I rewrote the scene so that Krem is the one who brings it up first. This makes it clear that Krem is comfortable discussing being trans, and the player will not be offending Krem by asking questions about it. 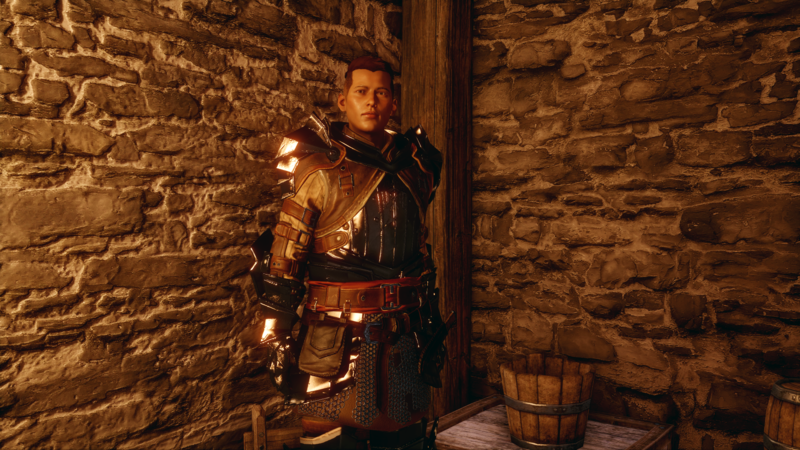 In the investigate hub where you can ask Krem about his past in Tevinter, the first draft had him deserting after fighting off someone who discovered his secret and tried to assault him. My friends noted that this played directly into the sad “attacked trans person” cliché, and while it was plausible, it was an ugly event that could well trigger trans people who have experienced harassment in real life. The goal was for Krem to be a positive character who was living his life happily now, and I revised his departure from Tevinter accordingly. We are all proud to have brought Krem to life in the game, and seeing people in the genderqueer community respond positively to him has been wonderful. We are also listening to feedback on how we can improve with characters in the future. (For example, some trans folks feel I wrote the player choices to be too clueless or uninformed, and wished for options to speak from more personal experience. I’ve heard the feedback, and I intend to do better next time.) It would be a lie to say that this was as easy as creating any other human character—it was uncharted territory for all of us on both the technical and the artistic side—but it was worth the extra effort. The world of Dragon Age has room for people of all backgrounds and identities, and it was a pleasure to show that in one more way.